The Sawtooth National Forest covers over 2 million acres, predominately across south central Idaho. With a variety of habitats, 10 mountain ranges, and more than 1,000 lakes, the forest is a popular recreation destination. Outdoor recreation is the main economic driver in many communities in and around the forest. To keep tourists coming, it is essential to maintain the region’s trails, camp sites, and other recreation-related infrastructure. 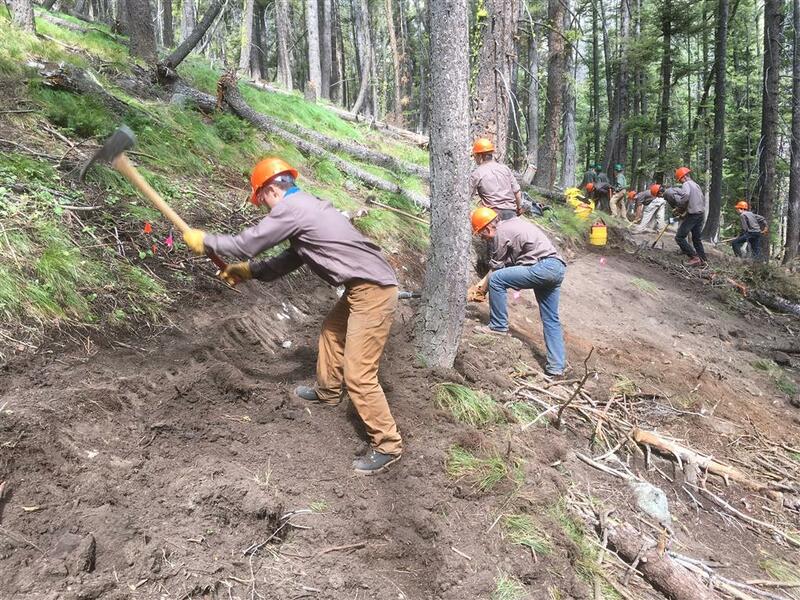 This past summer, youth serving with Idaho Conservation Corps (ICC) – a program of Northwest Youth Corps – performed much-needed maintenance on the Oregon Gulch Trail, a popular route in Ketchum, ID for biking, hiking, horseback riding and motorsports. The Corps participants, who ranged in age from 16 – 18, were part of ICC’s Youth Corps camping program. 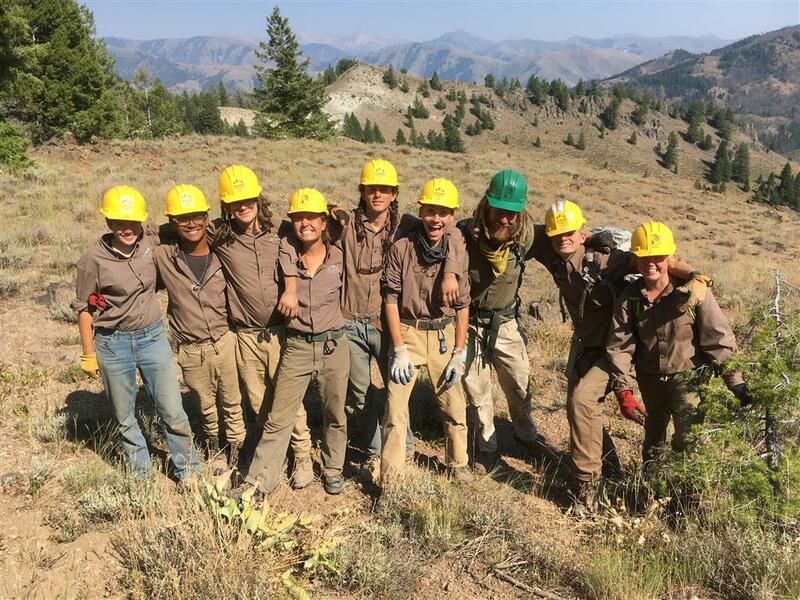 This program gives teenagers the opportunity to gain hands-on work experience by spending five weeks travelling throughout Idaho to perform important maintenance and improvement projects on public lands. 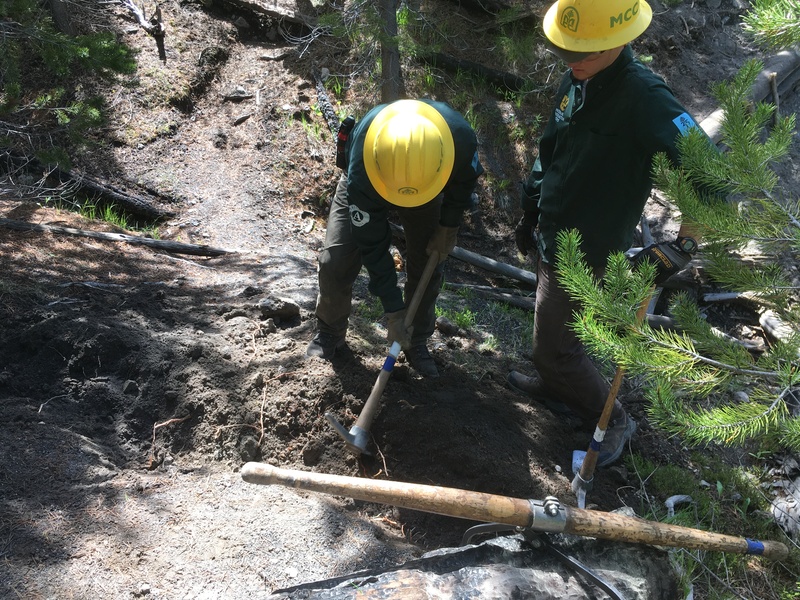 Work on the Oregon Gulch Trail was completed by two ICC crews during July and August 2017. With drainage issues and sections of heavy rutting, the trail was in need of attention. To better understand the needs of trail users, Corps participants had the chance to experience the Oregon Gulch Trail on mountain bikes. Then, working alongside the professional Ketchum Trail Crew, based out of Sawtooth National Forest, the ICC members learned the processes involved in laying out a new trail and designing features to increase trail complexity for riders. 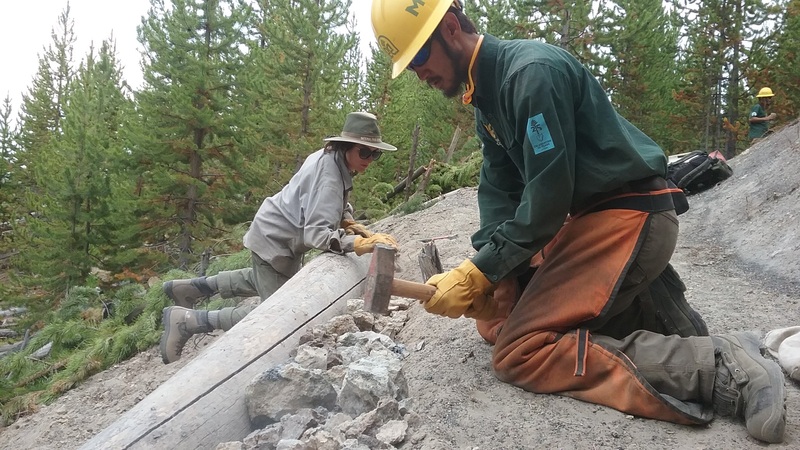 Using ten-pound pick-mattocks, the two ICC crews completed over 2,000 hours of service on the trail. They improved 50 drainage structures, restored one mile of existing trail, and constructed roughly a mile of new trail to route around a section that was rutted beyond repair. 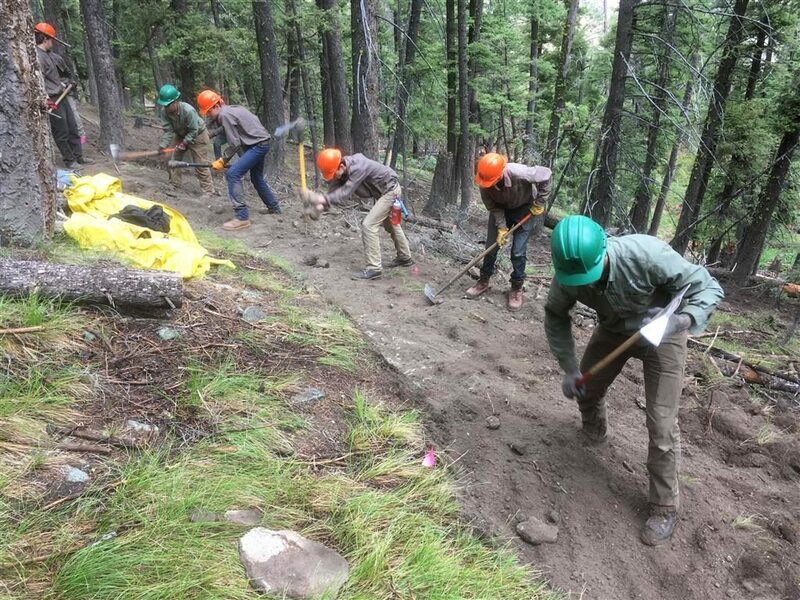 With guidance from the professional trail crew, the Corps participants learned and practiced skills to build a quality trail. They also learned many intangible lessons. This experience meant an opportunity to discover one’s true self without the boundaries placed upon us by society. This experience has been a gateway to self-discovery in its purest form. For many of us, life is a cardboard box; a box of social groups, cultural norms, identity boundaries, and restriction of expression. Every now and again, the wind blows and the box tumbles head-over-heels, allowing us a brief glimpse of our true nature and the nature of the world around us. But, almost always, the box lands open side down. This program reminds us that we are strong enough to “break through the cardboard.” This adventure gives us the opportunity to separate ourselves from the cycles that dis-empower us. The only thing preventing you from being your true self is the illusion of disempowerment perpetuated by these cycles. Take a second to reflect on your experience, and, if you realize nothing else, realize that none of this is possible alone. Thank you to Ariana Songer of Idaho Conservation Corps for providing information for this story. This entry was posted in Partnerships, Trail Maintenance, Uncategorized on October 25, 2017 by Hannah. National parks an important part of local economies, particularly in rural areas. Last year, a record 331 million visitors spent over $18 billion at national parks and their surrounding communities. Yellowstone, one of the top ten national parks by visitor spending, attracted more than 4.2 million visitors and generated $524.3 million. Described as the world’s first national park, Yellowstone has many attractions for thrill-seekers and explorer’s alike. Visitors can go camping, view wildlife, enjoy horseback riding, and take the Yellowstone Pledge: To be a steward and help protect myself and the park. What most people come for, however, are the hot springs. Spread across Wyoming, Montana and Idaho, Yellowstone offers 3,500 square miles of wilderness recreation area, sitting atop a volcanic hot spring. 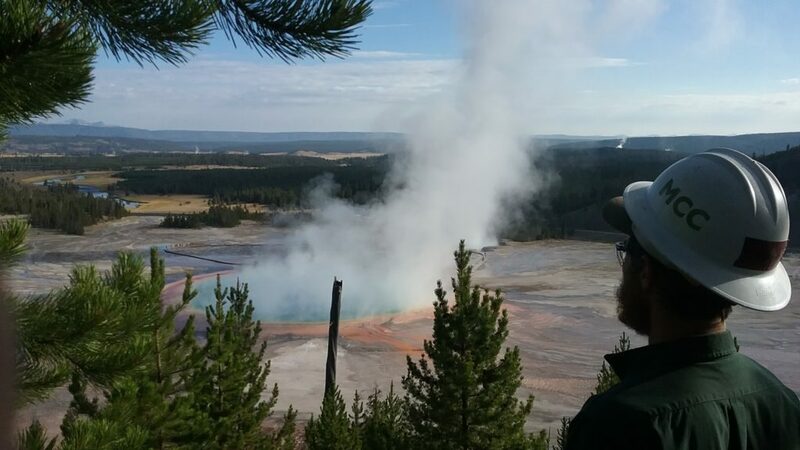 Geothermal attractions include Old Faithful and the Grand Prismatic Spring. 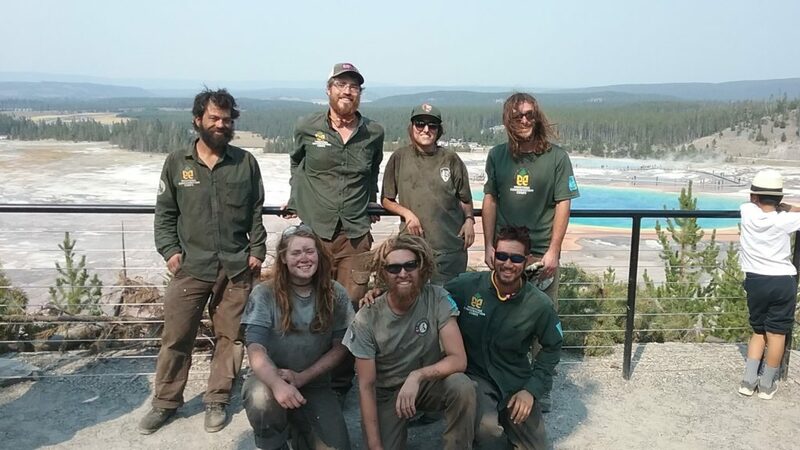 To address surging visitation, and growing concerns for visitor safety and resource preservation, the park’s Yellowstone Conservation Corps partnered with Montana Conservation Corps (MCC) – a 21CSC Member Organization – to create a trail to an overlook above the Grand Prismatic Spring, one of Yellowstone’s most visited thermal treasures. The 0.6-mile-long boardwalk trail was constructed over a 10-week timeframe: July 9 – September 16. The main goals of this project were to enhance the visitor experience and protect the site. In the past, visitors frequented off-limit areas, creating “social trails.” Foot traffic from these informal trails caused erosion, putting visitors and the ecosystem in danger. The new trail offers Park visitors a sensational, safe view of the spring, while also protecting the thermal treasure and surrounding ecosystem. Because the project took place in one of the most visited national parks, the crews frequently interacted with the public. This enabled the crews to see firsthand the relationship between the park and visitors. 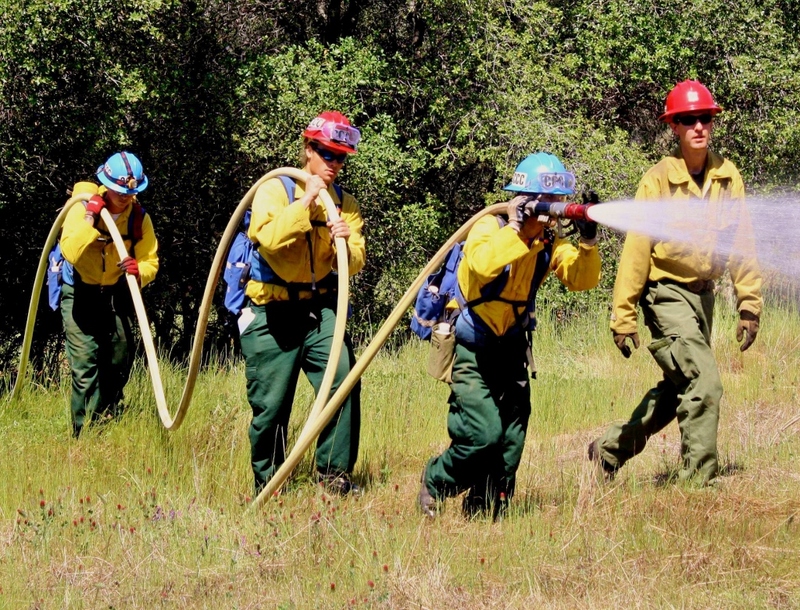 Crews learned how to convey the importance of ensuring fragile ecosystems remain undisturbed: “look, but don’t touch” is an essential practice for the safety of the environment and public. 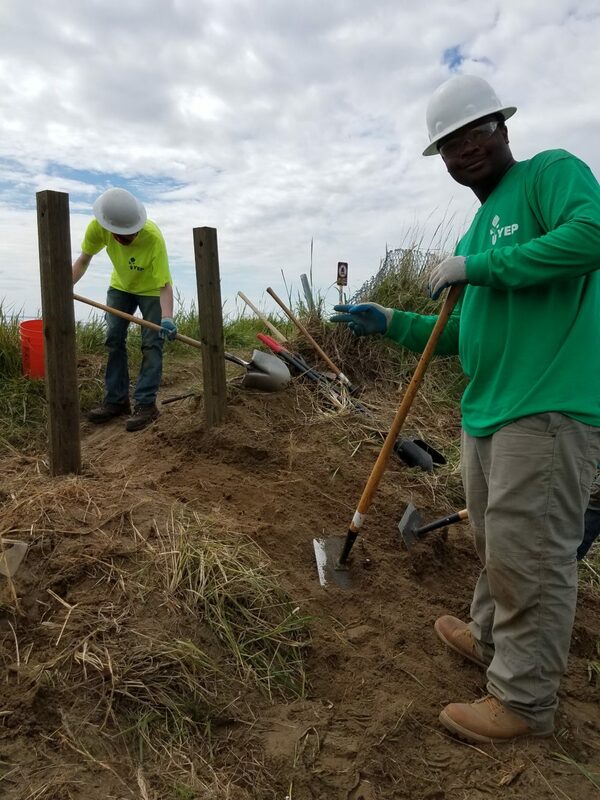 In addition to constructing the boardwalk trail, the MCC crews also installed erosion control structures, rehabilitated old social trails, and partook in slash-piling and bridge construction. 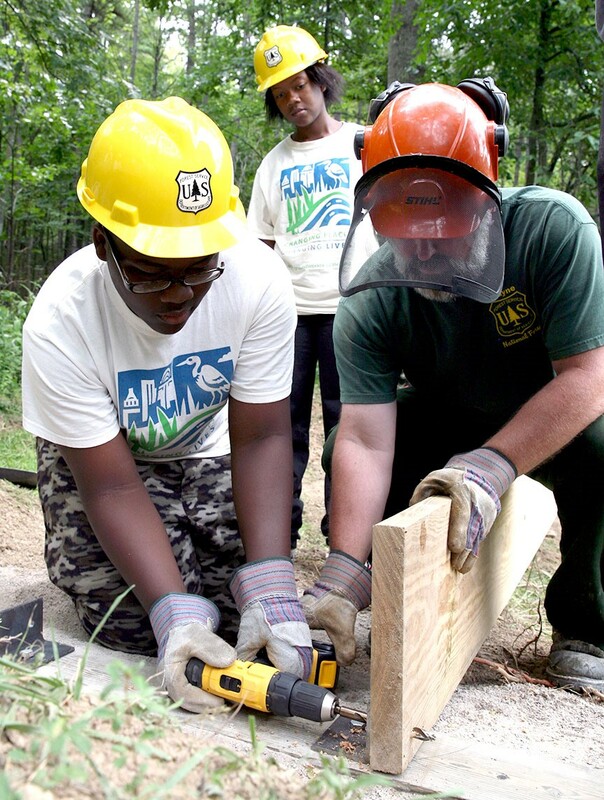 Throughout the course of the summer, the project engaged 18 MCC AmeriCorps members, ranging in age from 18 – 27. What sets Yellowstone apart from other parks is its rich history. Established in 1872, Yellowstone has seen over 11,000 years of human presence, including the activity of several historic tribes, the arrival of European Americans, and formal expeditions. This history drove the National Park Service’s mission to preserve natural and cultural resources. Thank you to Kelly Moorman, Communications Manager at Montana Conservation Corps, for providing information for this story. This entry was posted in Erosion Control, Partnerships, Trail Maintenance on September 29, 2017 by Hannah. Kincaid Park in Anchorage, AK is an easily-accessible wilderness retreat for city-dwellers. Located just south of the airport, the 1,400+ acre site offers spectacular views, designated areas for motocross and archery, and scenic year-round multi-use trails that wind through forested hills and along the coast. 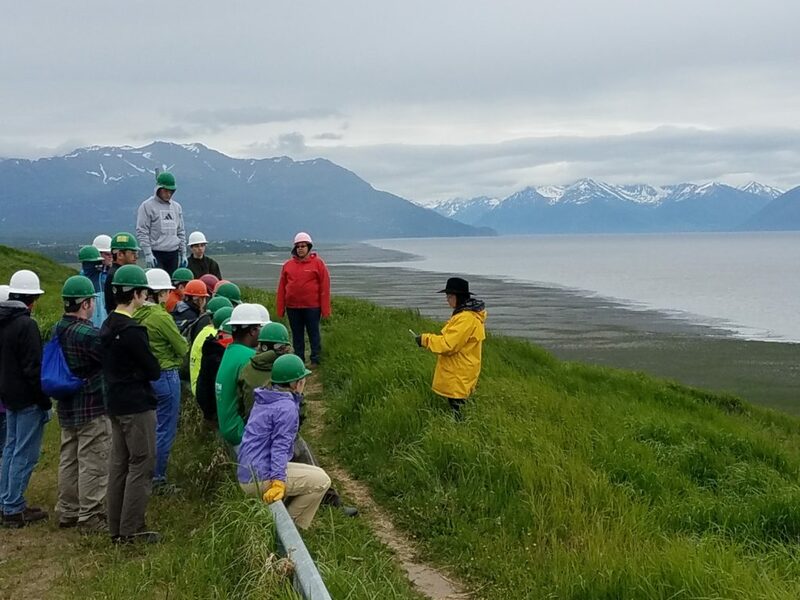 In June 2017, a Youth Employment in Parks (YEP) crew with the Anchorage Park Foundation – a member organization of the 21CSC – and Anchorage Parks and Recreation worked to help stabilize and reroute a popular bluff trail from Kincaid Park to the Anchorage Coastal Wildlife Refuge. From June 12 – 15, a crew of 24 YEP members helped restore the trail using a practice known as “sidehilling” or “bench cutting.” The crew cut into the sandy hillside, creating a relatively flat surface for the trail. Additionally, to prevent any further erosion, the crew installed 65 posts connected by 700 feet of rope railing. This new fence closes off an old “social trail” and encourages visitors to stay on the more sustainable sanctioned trail. The crew also installed over 300 plants, revegetating the slopes along the trail. The roots from these plants will help keep sand and soil from falling into the wetland. Brad Fidel, Field Educator for Anchorage Parks and Recreation, stated that the YEP crew members walked away from this project not only with skills to prevent erosion, but knowledge about why controlling erosion is important. This entry was posted in Habitat Restoration, Landscaping, Partnerships, Trail Maintenance on September 26, 2017 by Hannah. Last week, Groundwork Cincinnati-Mill Creek youth worked alongside Bill Scripp, a Recreation Technician from the Athens Ranger District on the Wayne National Forest in southeast Ohio. In this picture, youth are learning how to build a footbridge at Utah Pond near Nelsonville, Ohio. This story and photos provided by the U.S. Forest Service. In support of the 21st Century Conservation Service Corps (21CSC), the Wayne National Forest and Groundwork Cincinnati-Mill Creek, a nonprofit organization is one of several organization across the nation selected as an important partner in standing up the 21CSC, a collaborative effort to put America’s youth and veterans to work protecting, restoring and enhancing America’s great outdoors. 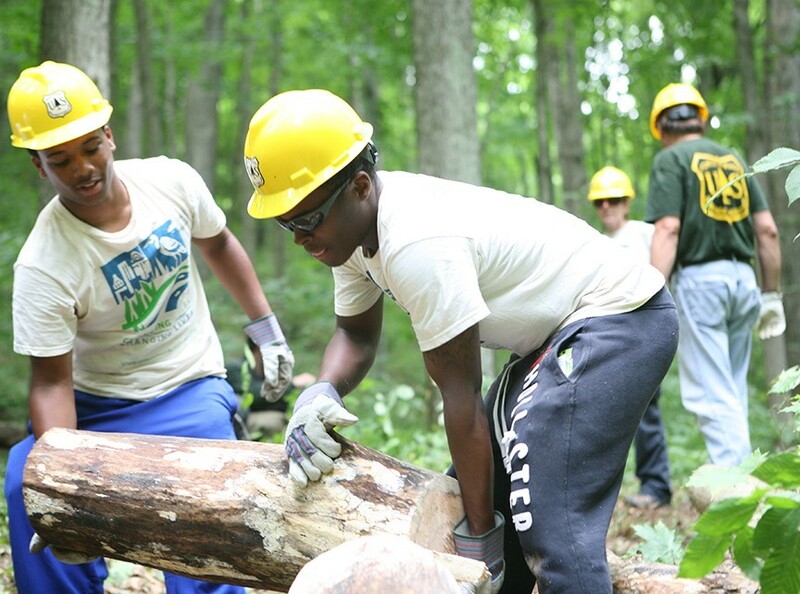 The partnership includes multiple opportunities over the next several months for Wayne National Forest employees to connect with young people on the Forest and at Groundwork Cincinnati-Mill Creek. Several young people are accomplishing meaningful work, and gaining important personal and professional skills, while building a lifelong connection to the outdoors. 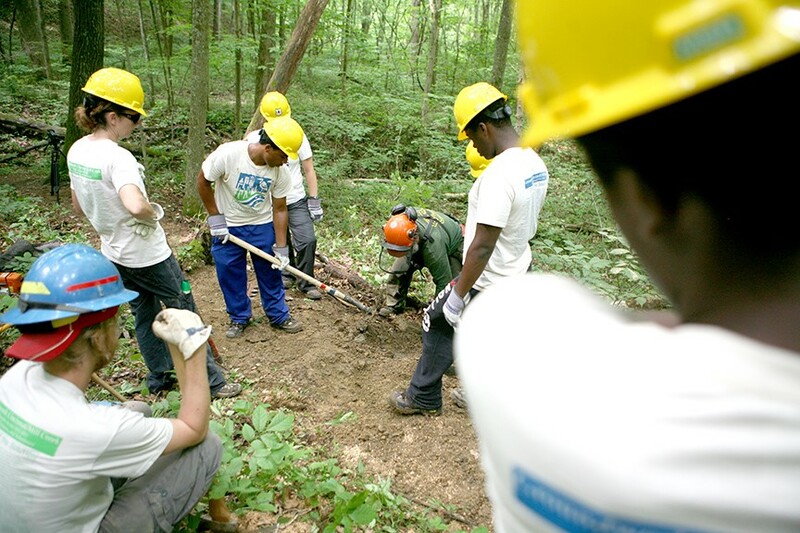 This entry was posted in Construction, Trail Maintenance and tagged 21st Century Conservation Service Corps, Athens Ranger District, Groundwork Cincinnati-Mill Creek, photos, U.S. Forest Service, Wayne National Forest on August 5, 2014 by Hannah.